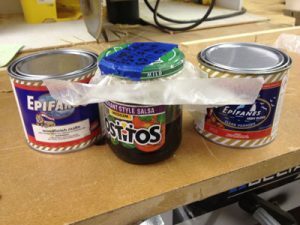 When a friend advised me to thin my Epifanes varnish 50% to 75%, my first thought was, “I don’t want to pour this expensive stuff into a measuring device and lose 10% of it.” The perfect solution was a Tostitos salsa jar. Its volume is small enough to make tiny batches, big enough to do a small project and the mouth is wide enough for a 2½” brush. One doesn’t need a high degree of accuracy in dilution. Fill the jar half-full of varnish and fill it the rest of the way with mineral spirits and you’ve got 50:50. Or, close enough. Perhaps its best characteristic is the rubber-sealed lid that allows one to shake the dickens out of the contents with no spilling. The rubber seal, however, is a two-edged sword. That same rubber will soak up finish and cement the lid to the jar until the cows come home. I found out the hard way. Had to resort to my Mama’s technique of smacking the lid in the direction that would open it. The next time I doubled a small sheet of waxed paper over the mouth before closing the lid. No more sticking. Of course, any jar with a lid can do the same thing, but one with a narrow mouth will require decanting the mixture into another vessel. Be sure to label the jar so you know whether it contains matte or gloss varnish and the degree to which it was diluted. A salsa jar makes a good, splash-free, resealable finish-mixing container. A shallow jar like this can also be stirred with a credit-card ministrip. I love Epifanes. Been using that for years – great stuff. I typically mix it with both thinner and oil in 1/3, 1/3, 1/3. Though my first coat is mostly oil and my last coat or two is mostly varnish. Tips from Sticks in the Mud – November 2016 – Tip #1 – Making a Movable Exhaust Fan POLL: Do Distractions/Interruptions Cause You To Make Mistakes?